Bob Musil visited St. Edward’s University in Austin, Texas as a Woodrow Wilson Visiting Fellow. The Fellowship program is maintained by the Council of Independent Colleges (CIC). Fellows are selected by campuses nationwide from a group of distinguished Americans who are prominent in public life and bring outside expertise to colleges in a variety of areas. Musil is one of the most popular of Woodrow Wilson Visiting Fellows, especially in environmental, social justice, and leadership issues, having been in residence at some two dozen campuses in recent years. 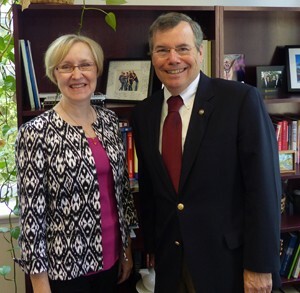 Robert Musil meets with Dr. Mary Boyd, Vice President for Academic Affairs. 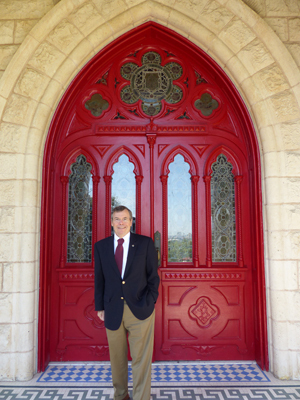 At St. Edward’s, one of the leading liberal arts colleges in the Southwest and a Roman Catholic college whose mission includes sustainability and social justice, Dr. Musil was hosted and introduced by Dr. Sharyl Cross, Director of the Kozmetsky Center for Excellence. Musil’s public lecture, “Rachel Carson, Science, and Faith?” was given to an enthusiastic audience packed into the university’s Carter Auditorium. In his talk, Musil stressed Rachel Carson’s impeccable science in writing about the oceans and especially in Silent Spring, her 1962 best-seller that exposed the dangers of DDT and other pesticides to animal and human health. But Musil stressed that Carson’s environmental ethic holds that pure science alone is never enough to solve human problems. Carson believed that without awe, imagination, wonder and a deep spiritual connection to all creatures, mankind was likely to end up destroying life, rather than protecting it. Musil also described a host of faith-based initiatives around global climate change and the environment as described in the RCC report Behind the Wall: American Religion and Global Climate Change. At St. Edward’s, Musil met separately with President Dr. George Martin, Vice President for Academic Affairs, Dr. Mary Boyd, and all of the university deans — from business to natural sciences to the humanities — to discuss how to further deepen and improve St. Edward’s commitment to student engagement, sustainability, and social action. St. Edward’s students were also able to benefit directly from Dr. Musil’s visit as he met with classes in global studies at the Living and Learning Center, in environmental policy, microbiology, and ethics. One outstanding St. Edward’s students, Christine Lacayo, the graduate assistant for sustainability, signed up for an online internship with the Rachel Carson Council in Communications and in Climate and Energy.